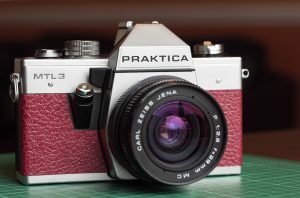 How to re-cover a Praktica MTL3 in camera leather. The Praktica MTL3 and MTL5 early models are both the most easiest cameras to re-skin. The reason for this is because the earlier models didn’t have a self timer to cut out and the old skins lift very easily. Before we delve into the steps involved please do follow the instructions carefully. Take great care as you go, knives are sharp and cleaning products can do damage as well as clean. 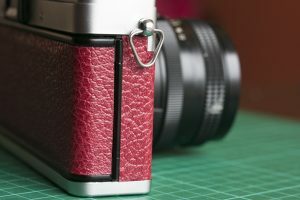 Like most tutorial websites here comes the disclaimer; Milliy’s Cameras can not be held responsible for any accidents or damages to persons or goods, so please use this tutorial at your own risk. Window Cleaner or Lighter Fluid, (Highly Flammable so please take care). The first thing we need to do is remove the old covers. The easiest way to do this is to gently lift one corner and then peel. Be careful not to stretch the cover as we will be using them as a template to cut the new covers. The front covers have a thin sliver of metal which packs out a step in the body, (see photo right, No. 1 and 2). If these come off with the skin then they will need to be replaced using double sided tape to do so. The next step is to clean all the old adhesive off the camera body, on some cameras this can be done by rubbing with a finger, the adhesive rolls off. I have had a couple where a cleaning product was needed, for this I use lighter fluid. I do have some customers who tell me they use a window cleaner like Windex. Once the camera is clean start applying double sided tape to the back of the covers. Use a knife to trim the edges before removing the backing. After I remove the double sided tape backing and before placing the old cover down on the leather sheet. I place the cover with adhesive side down on my jumper, t-shirt or jeans to make the double sided tape less sticky. This makes it easier to part from the leather after cutting the new covers. 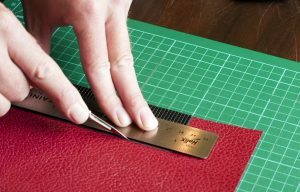 Once you have done this you can place the cover down on to the leather for cutting around. One thing before cutting make sure you have a new blade in your knife, a sharp blade makes clean cuts and less mistakes. Cut all of the skins needed before fitting and take your time. 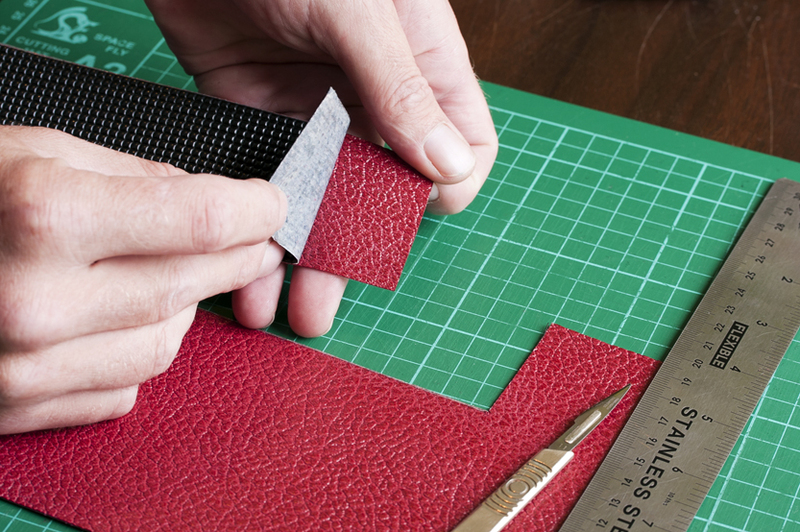 Once cut remove the old skins from the newly cut leather skins. There is an art to fitting new skins and the best way to do it is to remove the adhesive backing using the blade of the knife to separate the backing paper. This can be a fiddly job so take your time and if it don’t want to separate move to a different corner and try again. I tend to start with the rear panel and then move to the front panels. Starting at the hinge lay the rear panel so that it is level and aligned correctly. As you lay it smooth out starting at the hinge rubbing away to the other end of the door. The idea here is to not get any trapped air which will cause air bubbles. The adhesive on my leathers bond under pressure applied to the surface, so the harder you push the better it bonds. Be careful to not damage your camera by pushing to hard in a sensitive area. One time I accidentally pushed my finger through the view finder window while not paying attention to what my other fingers were doing or where they were placed. You only make this stupid mistake once believe me. Moving on to the front covers again remove the backing paper first with a blade. The best way to lay them is to lick the adhesive just a cm or two on the edge that will but up to the lens mount housing. This will temporarily deactivate the adhesive so you can slide it in to the correct position. Don’t worry the adhesive is non toxic so your tongue won’t fall off or develop spots. 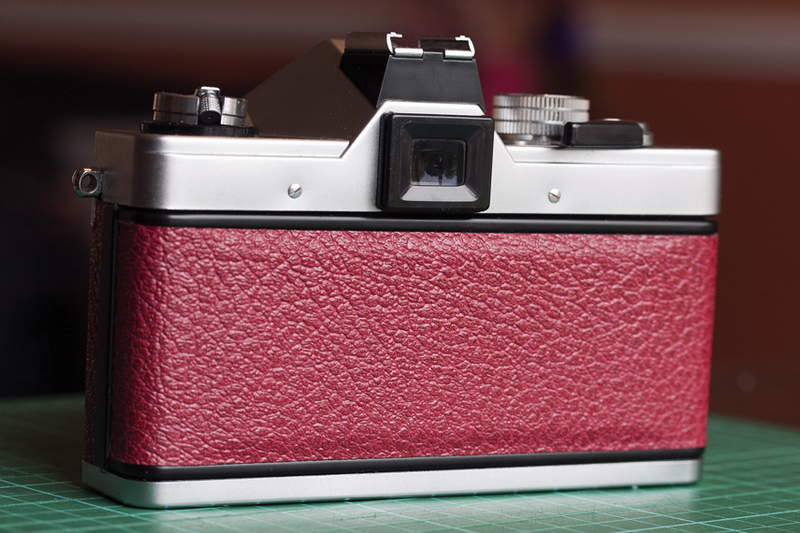 Once in place and doing the same as the rear panel gently lay and rub outwards to the side of the camera. The part you licked will take about 20 minutes to dry and can be pushed down to adhere to the body around this time. 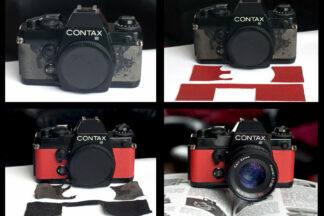 Once you have finished both of the front panels your camera should look like this sporting its new camera leather. That’s if you chose the dark red leather as I did here. I also have dark green and black in the same grain/texture as this leather available. 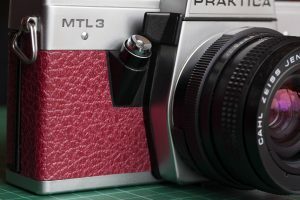 Another accurate method, particularly if original leatherette is missing, damaged or stretched/distorted, is to make your own template using low-tack painter’s masking tape. Some are simply too low-tack however, and fail to stick around curves etc so, the one I prefer and use all the time is, Scotch 3434 by 3M and is Blue in colour. 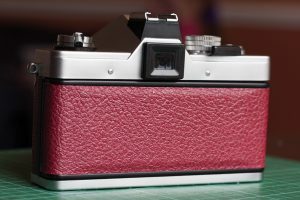 This can be relied upon to follow any curves or ridges on a camera body and importantly, despite adhering quite firmly, can easily be removed without leaving any residue. Brilliant stuff! This tape is available in various widths but I tend to use only the 25mm (1″) size, overlapping each strip by about 4mm when applying to the camera. 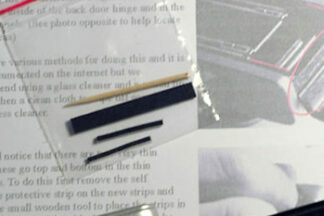 This method is really quite easy to master and the tape is easy to cut or trim with scissors or a sharp scalpel blade. Simply cover the entire area of each of those on the camera requiring new leatherette. Once completed, use your scalpel to gently lift one corner and gently and slowly, peel your new template away from the camera body, being careful to keep the overlapped strips of tape forming your template, together. This highly accurate template can then be placed directly onto your sheet of new leatherette (face side up)*, gently smoothing it down to lay flat before cutting around it to create your new coverings. *Don’t worry about your new leatherette when sticking it to the face side of your new leatherette; this tape won’t harm it at all. 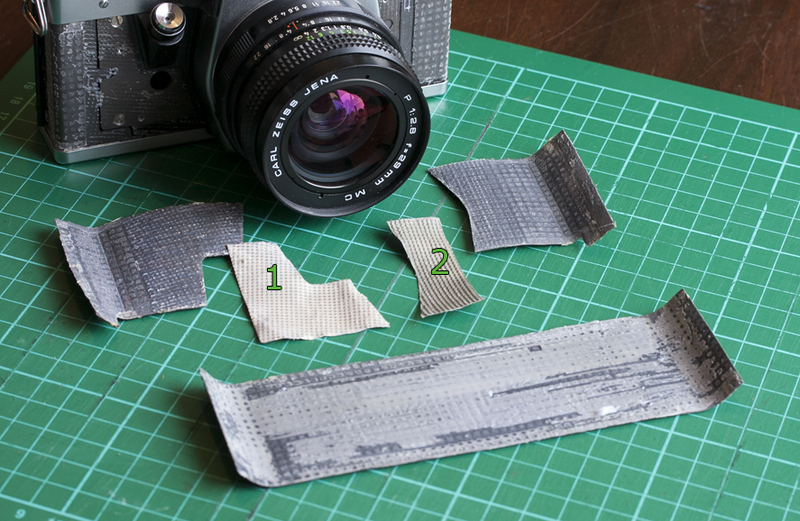 In fact, I also use this tape for cleaning the leatherette on my old cameras. Simply place it on the old/dirty leatherette, rub down quite firmly and then peel it off, taking all the dirt with it as you do. It works a treat! Just make sure your old covering is firm before trying this for, if it’s loose, it will lift off with the tape as you peel it off! Thank you David for taking the time to stop by, great advice here that does indeed work well.